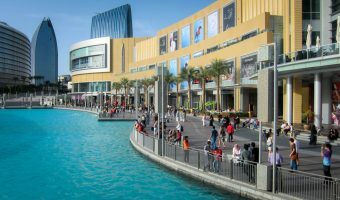 The Arabian Center is a mid-sized shopping mall in Al Mizhar, Dubai. It opened in 2009 and caters mainly to locals. There are around 150 outlets here, spread over two floors. Stores include a large LuLu hypermarket, Matalan, Homes r Us, Daiso, H&M, and Paris Gallery. Entertainment options include a cinema and a synthetic ice skating rink. Shops at the Arabian Center are listed below. Listings were last updated on March 1, 2019 . Al Musheer – Arabic clothing for men. Al Thawb Al Watani – Tailors. Babyshop – Children’s clothing, nursery furniture, car seats, prams etc. Basic Baxx – Fashion for men and women. Call It Spring – Shoe store. Charles & Keith – Women’s shoes, bags, and accessories. Chipi – Fashion for children. Claire’s – Fashion accessories for women. Daiso – Japanese discount store. Dubai Library Distributors – School and office supplies. Exquisite – Branded perfumes and cosmetics. Farada – Arabic footwear for men and women. Fares – Arabic footwear and accessories. Guess Accessories – Fashion accessories. Homes r Us – Home furniture and decor. Hour Choice – Branded watch store. Jacky’s Electronics – IT, mobile phones, cameras, consoles, home appliances etc. Just Accessories – Bags, jewellery, watches etc. Kair – Children’s fashion store. Kiddy Zone – Toy shop. Kreidie My Fair Lady – Arabic womenswear. Malabar Gold – Jewellery and watches. Moda House – Clothes, shoes, and fashion accessories. Mothercare – Maternity clothes, children’s furniture and bedding, prams and strollers, car seats, baby feeding products etc. Nayomi – Nightwear, lingerie, and underwear. Nooran – Arabic womenswear (abayas, sheilas etc.). Quatro – Women’s clothing and fashion accessories. Sacoche – Women’s bags, leather goods, and fashion accessories. Sweet Lady – Arabic ladieswear. Taif Al-Emarat Perfumes – Arabic fragrances. Venus – Cosmetics and perfumes. V Perfumes – Branded perfumes. Places to eat and drink at the Arabian Center are listed below. Al Qubtan (First Floor Food Court) – Seafood and chicken. Applebee’s (First Floor) – American restaurant and grill. Menu includes steaks, ribs, burgers, pasta, and seafood. Baskin Robbins (First Floor) – Ice cream and desserts. Bombay Chowpatty (First Floor Food Court) – Indian. Chinese Palace (First Floor Food Court) – Chinese. Costa Coffee (Ground Floor) – Coffeehouse. Dipndip (First Floor) – Chocolate desserts. Dome (Ground Floor) – Cafe offering breakfast, baked goods, soup, salads, sandwiches, desserts, coffee, fine teas etc. Dum Dum Donutterie (Ground Floor) – Doughnuts and beverages. Gloria Jean’s Coffees (Ground Floor) – Coffee, beverages, cakes, muffins, croissants, sandwiches, wraps, and salads. Godiva (Ground Floor) – Gourmet Belgian chocolates, cookies, truffles etc. Hatam (First Floor) – Iranian restaurant. Jungle Juice (First Floor Food Court) – Fresh juices, fruit salads, smoothies, yoghurt etc. KFC (First Floor Food Court) – Fried chicken, chicken sandwiches, fries, and salads. Mashakeek (First Floor Food Court) – Kebabs. McDonald’s (First Floor Food Court) – Burgers, salads, fries, and desserts. Nando’s (First Floor) – Portuguese peri-peri chicken. New York Fries (First Floor Food Court) – Fries with various toppings. Romys (First Floor) – Indian restaurant (formerly Macys and Ceasars). Starbucks (Ground Floor) – Coffeehouse. Tony Roma’s (First Floor) – Ribs, steaks, and seafood. Vivel Patisserie (Ground Floor) – Cookies, cakes, tarts, macarons, dates, sandwiches, fine teas etc. The Arabian Centre is open every day of the week. Opening times for the stores are Sunday to Wednesday 10 am to 10. 30 pm, Thursday and Friday 10 am to midnight, and Saturday 10 am to 11 pm. The mall is situated on Al Khawaneej Road in Al Mizhar, just north of Mirdif and east of Dubai International Airport. There are no Metro stations within easy walking distance of the mall. Map showing location of Arabian Center.